"Sometimes a space in time feels like a slap in the face. First you don't breathe, then you touch the spot, then you can breathe again. Anybody who's been slapped knows this. That's why you can life with getting slapped once every now and then, just not over and over all the time. You need the quiet spaces between." One thing about novels set in the South: they're up against an awful lot of fine, fine writing. Especially when the topic involves the Civil Rights era.Then not only must it avoid being trite, it had better find a new angle or it may as well fold up the tent and leave town. Because, dear reader, that has been done to absolute death. To the extent it's in danger of losing meaning from over-use. Do we need another book set in the Jim Crow South? Having read a lot of this southern – and occasionally pseudo-southern – writing, I think I have a pretty good sense what's genuine and what isn't. And sometimes I believe southern writing has been done to death. Every few weeks it seems another book set south of the Mason-Dixon comes out, case in point Kathryn Stockett's The Help, a book obviously written with book clubs in mind. It's splattered all over the cover. Or it may as well be. Not that it's an awful novel, but let's just say one more edit would have been a great thing. The South, in and of itself, is its own entity. That's one thing you must realize. Unlike other areas of the country, the South stands as character; it's not merely a setting. And it takes a fine author to craft a truly southern novel. The fact of being from the South makes little difference. You can't just be from the South; the South must be within you. Having said that, we come to The Queen of Palmyra. Not a bad novel, in fact it's decently-written. It won't stand the test of time, but it's not a bad way to spend a couple days, either. If I had to point out its biggest flaw I'd say it's stereotypical. Extraordinarily so. There's the little girl, the apple of her father's eye, who feels ignored by her overwrought mother. Then the obligatory black servant with the heart of gold who takes her – Flo, the daughter – under her wing, so she comes to understand how loving and kind black people can be. And, finally, the "daddy," the worst nightmare of most southern stories. And the secret shared between father and daughter? You can see it coming from ten miles away. Any surprise in that denouement? I think not. Yet, there's something about the book. I didn't dislike it as I feared I would. Yes, nothing about it was truly new, but the prose was very good. 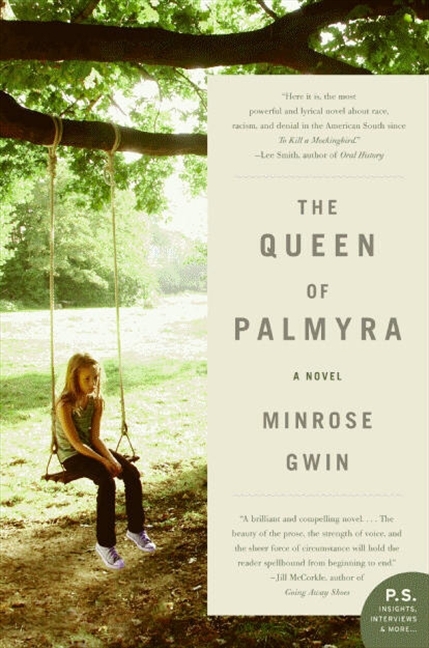 I wouldn't judge Minrose Gwin solely by this book. After all, writers need to purge themselves of that autobiographical first novel before they can go on to produce anything of real value. And, as Booklist said of her first book – a memoir – she is truly gifted with the capability of producing "lyrical prose." She just happens to have written two books obviously very close to her heart. Now maybe she's ready to move onto something a bit more extraordinary. Again, not a great book. Not one to stand beside Faulkner, Welty, O'Connor or Capote. But a fine attempt with some occasional soaring prose. "Some stories are like uneasy sleepers. They roam a dark house, gliding like silk from room to room. Touching a sleeping form here, tucking in a cover there. Maybe they will wake up on their feet and be confused as to their whereabouts. Or maybe they will unlock the front door without a sound and walk on down the street and out into the night, never to be heard from again. Because some stories can just up and leave. You don't know where they went, or whether they'll ever come back. Their leaving throws up its arms and leans forward into such an emptiness that the words rise up and say no." The short and sweet: Yet another southern novel. Good summer read/book club fodder. I enjoyed this novel, but wasn’t too thrilled with the ending. Now that you mentioned it, the characters did seem to fit the Southern stereotype that we (meaning those of us who have never lived in the South)have. I really like how you broke down the book. I haven’t read it yet, though I do have it on my TBR pile, so I’ll think of what you said while I read it. I’m so glad you were on this tour! You brought a perspective that hasn’t been voiced yet.